In late 2010 Dave Watts and partner Helen Sargeant travelled the east coast of Australia photographing our unique wildlife. 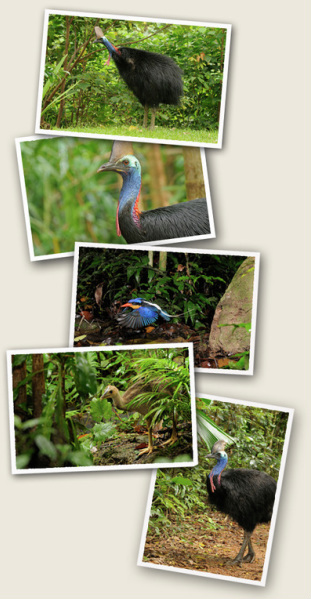 We met them at Mission Beach where they came specifically to find the cassowary. Despite the many sightings being reported at the time, they were unable to track any down. On their last day they got lucky. With several people alerted to call if they spotted one, David was able to get some great photos of Bingil Bay/Garners Beach’s ‘Joov’ and ‘Barbara’. They then traveled up to the Atherton Tablelands in search of the tree climbing kangaroo and the green possum. The wet and heat made the going difficult for the European residents but Dave managed to get some wonderful shots including of a kingfisher and it’s mate taking turns at spearing an ants nest with their beaks in the process of making a nest. 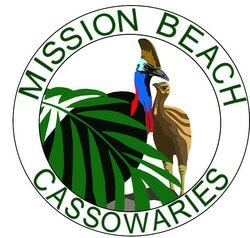 David and Helen called in again to Mission Beach on their way south and were fortunate to get some more cassowary photos, this time of ‘Ms Cass’ who had shown up after not being seen for over seven months. Before becoming a full time wildlife photographer Dave worked as a forest officer in the United Kingdom, a conservation officer with the Tasmanian Conservation Trust and as a wildlife ranger with the National Parks and wildlife service of Tasmania. Dave’s wildlife images have been widely published in such magazines as National Geographic, BBC Wildlife, Australian Geographic, Nature Australia and many others. Dave’s photography covers the full spectrum of natural history subject matter but where possible he does try to obtain images of the world’s more unusual mammals. Dave and Helen live in France and travel the world photographing wildlife. How great would that be? You can check out Dave's website and blog where he shares his latest techniques, photos, tips and travel. It was a pleasure to meet Dave and Helen and look forward to see the update on his blog and more photos of their latest trip to the Wet Tropics.